Muskogee Teen Center received this grant for the purpose of providing a safe, supervised environment for Muskogee youth to have recreation and enrichment opportunities during their out of school hours. The program is to operate year round with expanded hours during summer and school breaks. In some of the other sections I told about the challenges we have had with a group of youth at the beginning of the school year. While our staff understands that it is developmentally appropriate to be somewhat rebellious during the teen years, we were somewhat unprepared for the negative behavior we saw last fall. We were also unprepared for the number of youth exhibiting this behavior. We have always relied on a few well chosen rules, stated clearly and posted throughout the building. We always discuss them during tours or first visits and refer to them when any correction in behavior takes place. We also believe in our mission to provide a safe, fun place to be after school, where there is room for all personalities. All of that said, the past year was different. We had an approximately 40% increase in new members, primarily in the 7 & 8 grades, and for the first time, we had a lot of teen girls. Our staff was excited about all the new activities we could add to our program. While our seasoned members and a portion of the new members slid right into the routine we had a group of youth that just didn’t want to be here. This was a problem we had never really encountered. We see the Teen Center program as a choice teens make when deciding how to spend their time. We listen to them about what they want as far as sports, games, craft projects, snacks etc. and provide the items and activities within our resources that let them enjoy themselves. Our “resistant” (not sure how else to phrase this) group was not interested. They challenged our every practice i.e. signing in and out, not congregating loudly at the front desk, putting away belongings, etc. They also filled the stools in the bathroom with paper towels, wrote on the walls, misused materials, took food into non-eating areas, cursed openly at each other and refused to do much but sit and talk loudly to each other and disrespect our staff. Every night when closing up we would talk about how the atmosphere had changed and what we could try next. For the first time ever we started sending youth home for the rest of the day, week, two weeks etc. depending on the severity of the problem. It was quickly apparent that certain personalities kept things stirred up. We focused on the youth that were there because they wanted to be & were stricter than ever on our rules. By the time our resistant group figured out that we were determined to be in charge of our program and building & began interact & enjoy themselves a little we had a new problem. A group of feuding families had youth who attended the Teen Center. After mediating a few incidents between this group of youth, we had a big blow-up on a very busy night. A parent actually brought a group of boys into our building to fight some youth who were here playing basketball. The parent, actually engaged in the fight as well. We had to call the police and have help to manage the large crowd of youth that of course wanted to see what was going on and in a few cases, try to get involved. Luckily no one was seriously hurt & the staff did exactly what they had been trained to do in such a instance. While working with our CROs (Community Resource Officers) we became aware of some background on the feud. It involved guns, threats on social media. Officer Ron Mayes was extremely helpful in helping us decide how to handle suspensions. We suspended 4 youth for the remainder of the school year, expelled 2 who threated extreme violence, & installed a magnetic lock system at our front desk that allows us to lock our front doors immediately, buzzing people in & out. As horrible as this all was-it really shook our youth up. They had never seen anything like that happen here & we were determined they wouldn’t again. We added an additional staff member, a young woman who has great experience working with youth that is a great addition to our team. We also have really talked to the youth about making sure that they understand that this is “their place” and that we are all responsible for the culture we create here. 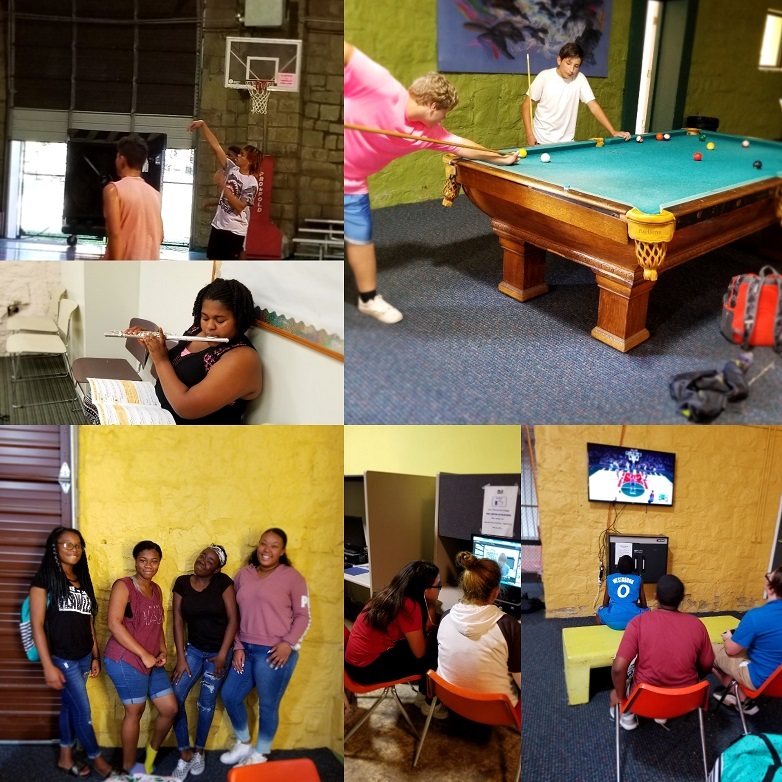 We’ve had a good summer, with lots of new, soon to be 7th graders who are fitting right in, and for the first time, we have had a lot of Teen Center youth join the Youth Volunteer Corps Summer of Service and participate in daily projects (even several of the resisters!). We are back in the saddle! It wouldn’t be a story without an ending and I am adding an attachment that is very sad. The 2 boys we expelled unfortunately continued to create problems for themselves and others and were also suspended from school. They were good friends & during the summer they went to OKC to stay with one boy’s dad who lived there. They were playing with a gun, making videos and one boy was shot and later died. His friend was charged. If anything can be salvaged from this tragedy, it is that we need safe, positive places and activities for youth. Our members knew these boys and their families. This is a teachable moment.